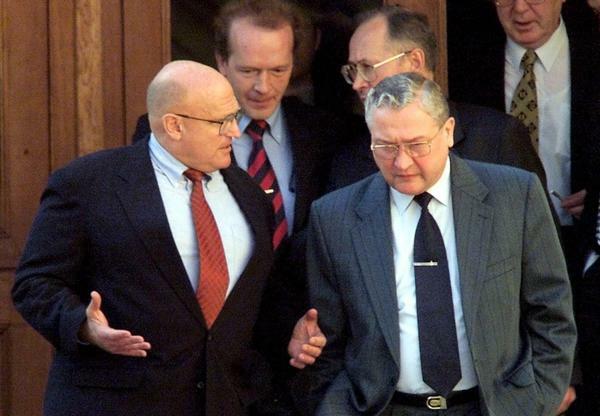 Vyacheslav Trubnikov (right) was head of the Foreign Intelligence Service, Russia's equivalent of the CIA, from 1996 to 2000. He's shown here speaking with U.S. Deputy Secretary of State Richard Armitage in 2001 in Moscow. Trubnikov was Russia's deputy foreign minister at the time. It's not every day that the man who ran Russia's foreign espionage service offers to buy you a drink. I'd been chasing Vyacheslav Trubnikov for an interview, when a message landed in my inbox: Hotel Metropol, 5 o'clock. The Metropol is one of Moscow's grande dame hotels, just steps from Red Square, with polished dark wood, sparkling crystal decanters, velvet armchairs. Trubnikov settled in and ordered a double espresso. He was born in Siberia and joined the Soviet KGB in 1967. He was immediately sent to Calcutta, India, under cover as a reporter. I asked him, did the other journalists know he was a spy? "To be frank, everyone who was in Calcutta was considered to be a spy. Everyone. Every journalist," he said. Twenty-nine years after he became a spy, Trubnikov ascended to the top job. He ran Russia's answer to the CIA, the SVR, or Foreign Intelligence Service, from 1996 to 2000. The SVR succeeded the KGB after the Soviet Union broke apart in 1991. For a man who has lived his life in the shadows, Trubnikov is surprisingly candid when asked, for example, about some of the U.S. officials he has worked with. "Amazing personality. Marvelous personality. At 5 in the morning, he is already [working] with weights, you know? Very manly," he said. Trubnikov was speaking about Richard Armitage, former No. 2 at the State Department. Trubnikov likes him. He is less enamored with former CIA director George Tenet. "I do remember Iraq. And he, unfortunately, he was instrumental in trying to prove the existence of WMD [weapons of mass destruction] in the hands of [Iraqi leader] Saddam Hussein," Trubnikov said. "It was absolutely incorrect. I tried to persuade him that this is nonsense. He did not believe me. Unfortunately." Trubnikov is also unimpressed by America's National Security Agency. "A huge machine. But, its usefulness from my point of view is not only limited but it's meager," he said. "A lot of info which is absolutely unnecessary and impossible to digest. A lot of money spent just for nothing." So what should intelligence money be spent on? Trubnikov pauses and takes a nibble of a chocolate cookie. "Today, to get any kind of secret paper, with the top-secret info — that's nothing," he said. "It is essential to penetrate into the brains of those who are leading the countries." And to penetrate the brains of foreign leaders — to predict your adversary's next move — Trubnikov says only human intelligence works. Meaning, traditional espionage. "An intelligence officer must grow up to the level of Michelangelo," he said. What does Michelangelo have to do with a modern Russian spy? Trubnikov's answer: The best spy is a Renaissance man. "He has to have in his brain an encyclopedia. He cannot today be a very narrow specialist. To get information, very, very delicate information. This is the task of an intelligence officer." Trubnikov and I spoke for more than an hour, touching on matters from Edward Snowden, the former NSA contractor who leaked government secrets and fled to Russia, to the wonders of 3-D printing. It was only afterward, that the true strangeness of our conversation struck me. Who would have imagined it, a generation ago: A Soviet spymaster talking tradecraft, with an American reporter not even born when he began stealing secrets for the KGB. And then the two of us shaking hands and going our separate ways, into the Moscow evening. You never know who you'll bump into at the Hotel Metropol. That's one of Moscow's old grande dame hotels, steps from Red Square, across the street from the Bolshoi Ballet. After the Russian Revolution, Lenin's people took over the hotel and turned it into living quarters for the Bolsheviks. In the lobby these days, you're more likely to run into American business travelers, German tourists and, of course, Russian spies. NPR's Mary Louise Kelly reports. MARY LOUISE KELLY, BYLINE: It is not every day that the man who ran Russia's foreign espionage service offers to buy you a drink. I'd been chasing Vyacheslav Trubnikov, asking for an interview, when a message landed in my inbox - Hotel Metropole, 5 o'clock. We found a table here in the back of the bar. Think polished dark wood, sparkling crystal decanters, velvet armchairs. General Trubnikov settled in and ordered a double espresso. He was born in Siberia, joined the KGB in 1967 and was immediately sent to India undercover as a reporter. I asked him, did the other journalists know you were a spy? VYACHESLAV TRUBNIKOV: To be frank, everyone who were in Calcutta were considered to be spies - everyone - every journalist. WERTHEIMER: Twenty-nine years after he became a spy, Trubnikov ascended to the top job. He ran Russia's answer to the CIA, the SVR. That's a successor to the KGB. For a man who's lived his life in the shadows, Trubnikov is surprisingly candid when asked, for example, about some of the American officials he's worked with. TRUBNIKOV: Amazing personality, marvelous personality. At 5 in the morning, he is already with weights, you know? Very manly. KELLY: He's speaking there about Richard Armitage, former number-two at the State Department. Trubnikov likes him. He is less enamored with former CIA Director George Tenet. TRUBNIKOV: I do remember Iraq. And he - unfortunately, he was instrumental in trying to prove the existence of weapons of mass destruction in the hands of Saddam Hussein. It was absolutely incorrect. I tried to persuade him that this is nonsense. He did not believe, unfortunately. KELLY: Trubnikov is also unimpressed by the NSA, America's National Security Agency. TRUBNIKOV: A huge machine, but its usefulness, from my point of view, is not only limited, but it's meager. KELLY: You heard that right - meager. TRUBNIKOV: A lot of information which is absolutely unnecessary and impossible to digest - a lot of money spent just for nothing. KELLY: OK, so what should intelligence money be spent on, I ask. Trubnikov pauses, takes a nibble of a chocolate cookie. TRUBNIKOV: Today, to get any kind of secret paper with the top-secret info, it's nothing. It is essential to penetrate into the brains of those who are leading the country. KELLY: And to penetrate the brains of a country's leaders, to predict your adversary's next move, Trubnikov says, only human intelligence works, meaning traditional espionage. TRUBNIKOV: An intelligence officer must try to - to grow up to the level of Michelangelo, for example, you know? KELLY: Michelangelo? I pressed him on that. What does Michelangelo have to do with a modern Russian spy? Trubnikov's answer - the best spy is a Renaissance man. TRUBNIKOV: He has to have in his brain an encyclopedia. He cannot be today a very narrow specialist. But to get information - very, very delicate information - this is the task of an intelligence officer. KELLY: Vyacheslav Trubnikov and I spoke for more than an hour, touching on matters from Edward Snowden to the wonders of 3D printing. It was only afterwards that the true strangeness of our conversation struck me. Who would have imagined it a generation ago? A Soviet spy master talking tradecraft with an American reporter, one not even born when he began stealing secrets for the KGB, and then the two of us shaking hands and going our separate ways into the Moscow night. Mary Louise Kelly, NPR News, Moscow. Transcript provided by NPR, Copyright NPR.